Hitting the ball softer and higher. Resist the temptation to spend more time on the "favourite" side - spend at least as much or more on the weaker side. Keep a diary of your efforts recording details/statistics of drills over time. It is a good idea to practice by yourself at least once a week, even if it is just for 15 minutes, to take the time to pay attention to the technique. Any bad habits that have been developed over time tend to creep back into the strokes, and this will keep re-enforcing the correct stroking. Monitor how accurate the shot is during this practise to guage if the shot is performing well. Take up a comfortable position, and feel balanced, so as to generate the power necessary in the swing. Because this shot is usually done when the opponent has hit a defensive shot, there will be time to prepare for the footwork and swing, and usually this position holds the opponent behind until you have in fact executed the shot, leaving little time to recover the ball. Open racket face, with the swing coming down at an angle into the front wall, aiming about half a racket length from the corner. It is this angle that will take the ball into the nick. The swing is relative short and sharp but generating the maximum amount of power to get the ball away quickly. Learning how to finish off a rally. The angle of the hit into the nick. Hitting the ball at the top of the bounce taking advantage of the height of the bounce. Opening the racket face and slicing the ball into the nick. It makes the eyes focus on the ball. It highlights any flaws in the racket work. near the side wall makes it too difficult, step towards the center of the court where there is more room. Only hit the ball as fast/hard as you can control the ball, starting with one or two continuous volleys until you are able to get ten consecutive hits, then increase the pace. Start the exercise slowly, aiming around the cutline. If you have difficulty with the angle of the figure of 8 volley, commence with the drive figure of 8, and when you feel confident progress to the volley. Solo practice is the best way to hone in on the swing. Pick a target on the front wall, say, one racket length from the side wall and between the "tin" and "cut line". Aim higher to get the ball deeper. Aim lower if he ball is over hitting. Aim closer to the corner to take the ball closer along the wall. Aim further across to get the ball to carry to the back corner before hitting the side wall. Hit the ball high on the front wall. This drill requires patience. Start the drill slowly and gradually increase the speed as you become more consistent. A drop shot played well landing right in the corner takes a lot of practice. Use the open racket face to slow the ball down. Use a slicing or cutting action to undercut the ball. The backspin makes the ball sit down. The best drop shot tends to follow the wall. The Volley Nick works well from the center court position, particularly if played while intercepting a cross court. Why? The wide angle makes it easier to get the ball to sit into the nick. The shot is executed very quickly giving the opponent less time to get to the ball. Open racket and back spin the ball so it sits down into the nick. Move the feet and shoulders into position to get the tight angle into the corner. Try to take the ball early, as the height is an advantage in cutting the ball into the nick. Move into the shot . The overhead smash will limit the amount of time the opponent has to recover to the T.
It can be seen how taking the ball before it hits the back wall can quickly move the opponent away from the T and allowing more control within the court. The smash is not an easy shot as it required power to get the ball away early and quickly. The next best option would be to volley lob the ball to the back corner allowing recovery to the T and putting the opponent behind. Start practicing this shot from mid court and gradually move back. Watch the ball carefully to judge the speed, angle and height of the ball will assist timing. Start practicing this drill slowly and gradually increase the speed of the hit. Once in the center of the court volleys hit with authority put a lot of pressure on the opponent and can force errors. 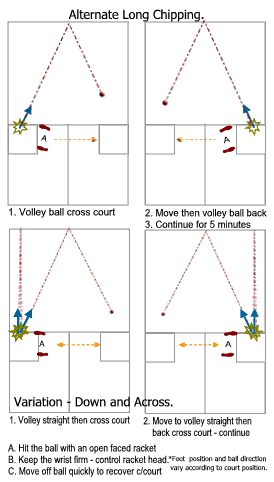 Leave practicing the top spin volley until you are confident with your volleying. This is an advanced skill and will take time to develop the racket control and reflex. It is a skill worth persisting with as it will improve many other elements of the game during play. Click on the Drill required to activate the frame on the right. Ghosting is a progression from squash technique exercises where the movements in the exercises are put together in a sequence of movement. By continually practicing these two aspects gradually fluent swinging, balance, and movement will develop. By then using this movement in a pretend playing situation court movement will become very smooth. Until there is a specific ghosting video, set up a series of balls on the court and play a pretend game, using this video as a guide. Firstly, start with just one stroke, eg forehand drive from the front of the court, moving from the T to the ball, swing, and recover to the T and repeat several times. Secondly, introduce a backhand shot, placing a ball around the service box, and now shadow play between these two shots concentrating on your racket work and movement, and swing technique. Thirdly, take your time, and as you get better rhythm and fluent movement, and then introduce a third ball position. Use this video as a guide to your movement and racket work. all of which can be practiced each day at home or prior to a squash game. 2. Hold the correct grip in front of the body (facing a mirror may be helpful). 3. Rotate the forearm from side to side, holding the racket firmly. 1. Hold the racket with the correct grip. 2. Lay the racket head back so the end of the racket points, with the shaft parallel to the floor. 3. Rotate the forearm from horizontal to vertical, holding the wrist firmly - this will resemble a forehand and backhand rotation.. Taking the rotation a step further, as described above, and adding a loop into the forehand and backhand movement - this should resemble a figure of 8 (laying on its side of course). Running on the spot with the racket held in the correct grip, wrist firm, perform a chipping movement with the racket while running on the spot. This might resemble an exercise like rub your belly and pat your head. Starting at the front wall of the court (facing the back wall), moving towards the back wall, lunge to the forehand side as if to get the body into a forehand swing position, pivot to the backhand side, as if to get the body and racket into a backhand swing position. During this movement keep the racket and swing in the "ready position" and move the feet and shoulders into the "hitting position". Strive to be balanced, taking the weight on both legs. Strive for a fluent movement by keeping the feet apart, with no hopping and skippy steps. correct forearm rotation - swing. Things to note: Stop like a statue while performing these actions, look at the grip, racket position, backswing, forearm rotation, follow through and correct where necessary.